Thanks, Vox, for posting the Alex Jones video. Alex Jones is, of course, a controversial character. I do not usually listen to him but I found this discourse on Tulsi to be quite accurate. Both Fulford and Q-Anon reckon that there was indeed an incoming missile heading towards Hawaii and that it was intercepted by the Alliance of Light Forces, who have very advanced technology. The submarine was reportedly destroyed. The plan of the "dark cabal" was to blame the attack on North Korea and hence start their much wanted World War 3. Understanding why this dark cabal wants to start a world war is beyond the scope of this forum, but I believe it goes well beyond the lust for money and power, and even beyond the depopulation agenda. TUCO ASKS THE QUESTION: Is Tulsi Gabbard really concerned about the welfare of all humanity, or is she only interested in the money and power? “TUCO ASKS THE QUESTION: Is Tulsi Gabbard really concerned about the welfare of all humanity, or is she only interested in the money and power? I sent the T.Gabbard article to another ex-er and I also asked them what they supposed Butler did when he got that txt? Butler gets text- he calls his secretary to arrange to get Butler off the island now. Perhaps he has a bunker already on his property, and if he doesn't he will have one soon. He's yelling "get Tulsi on the phone and get her to find out what the hell is going on". Which is the only real reason she was able to find out within 12 mins and become the hero of the day. They then saw it as a massive publicity stunt to garner some much needed press coverage. Tulsi (note ear piece in her ear), goes onto ABC, Meet the Press, CNN and repeats whatever is being fed into her ear. She is doing exactly with President Trump what she did with President Obama. Criticize him publicly, telling him what he should be doing- And on that note she is criticizing the USA as well. The same arguments were spoken by Butler's father many years ago and Rick Reed parroted the same rhetoric when he went against Inouye. Yes, move over Rodman, Tulsi Gabbard is coming to make peace with Kim Jong-un. So hypocritical considering she follows orders from a Dictator in her own life. We never saw her as an activist speaking out when the USA was overthrowing Sadam Hussein, or ousting Gadhafi- she was too busy chanting on her beads.” End quote. So, you now have an image of what a devotee of Butler’s will do in a crisis. It begs the query, what will Tulsi do? 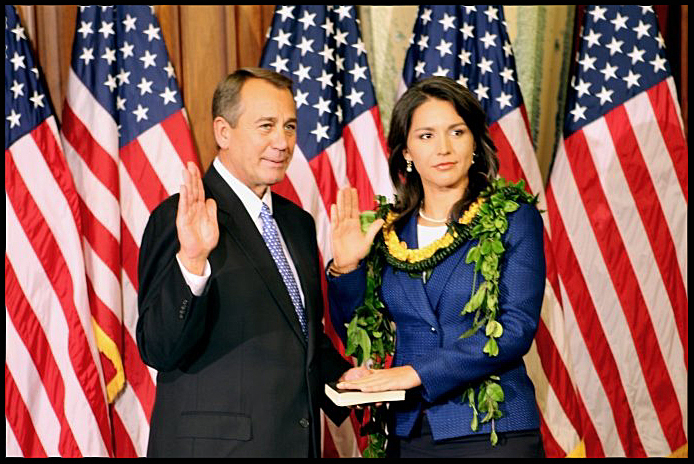 TUCO ASKS THE QUESTION: Is Tulsi Gabbard really concerned about the welfare of all humanity, or is she only interested in a specific person in humanity, the only person she answers to- Jagat guru Chris Butler. That was the scene of panic in Hawaii yesterday after the state emergency system sent out this alert to mobile phones statewide. Ballistic missile threat inbound to Hawaii. Seek immediate shelter. This is not a drill. That was a false alarm. Someone pushed the the wrong button. There was no missile threat. It took a full 38 minutes for the state to issue a civil merge message retracting the alert. How did you get the truth, walk us through what happened. "You can only imagine the panic, the terror, the chaos and confusion that ensued when over a million people in Hawaii and many visitors visiting Hawaii got that alert on their cell phones. Now understanding as they literally just have minutes. Taking this threat seriously. They have minutes to say good-bye to their loved ones. To find their loved ones. To try to find some kind of shelter somewhere, which, there are no designated nuclear bomb snerlts Hawaii. I went through the same thing when I got that message on my phone. Wondering where my family is. What they were doing. I called Hawaii officials and state of defense and asked them what is going on here? I was told right away there is no incoming missile threat. Someone pushed the wrong button. It was an inadvertent mistake. Why did it take them so long to retract it? That's what we're trying to get to the bottom of. It is unacceptable. The fact that it took so long for them to put out that second message, to calm people. To allay their fears that this was a mistake. A false alarm, is something that has to be fixed, corrected with people held accountable." Are you confident this won't happen again? That leads to the question now of what should done about it. Do you believe that President Trump should be speaking directly to the leader of North Korea? But given that, do we need to bolster the defenses of Hawaii? “We absolutely need to bolster our ballistic missile defense system specifically for Hawaii and for this country. That's something on the Arms Services committee that I have been and continue to work on doing. It think it's important as how we talk about how important it is that Trump directly negotiates with North Korea. We've got to understand why Kim Jong-un is continually saying he's not going to give up his nuclear weapons. Our country's history of regime change wars has led countries like North Korea to develop and hold on to these nuclear weapons because they see it as the only deterant against regime change. And this is what it is important for President Trump to recognize it is critical we change our policies of regime change wars, to provide that credible guarantee that the United States is not going in to topple the north Korean regime so these conversations can begin towards denuclearization." Just to be clear you are saying that Kim Jong-un's nuclear arsenal is our fault? Edited 1 time(s). Last edit at 01/20/2018 07:23AM by VoxVeritasVita Das. My source also sent me a snippet of a FB conversation from one devotee to a few others regarding the HI missle txt. "Waking up to this kind of screeching alarm will make anyone jump out of their beds and have their hearts start pounding and racing a mile a minute. But then again, this alarm did send out the BEST message of all. And that is to - SEEK IMMEDIATE SHELTER. When you have only 15 minutes to spare and not knowing where to go, what do you do and who do you turn to? FORTUNATELY for me, I have a spiritual master that has guided me throughout my life. He has taught me to take shelter in the Supreme Lord, who is our real protector. We do this by chanting His Holy Names, which is non different from Him. This is our real protection from ANYTHING in this material world. When I met up with my friends yesterday afternoon, we discussed the harrowing events of the morning. But one thing I was happy to hear was that we all did pretty much the same thing - we immediately got dressed and started taking shelter in the Supreme Lord Krishna. Some started chanting on their japa mala beads, while others cranked up the kirtan in their home. Of course we also searched for answers on the internet if this was really the real deal. But in the end, we knew there was nowhere else to go and nowhere else to turn to but in God’s Holy Names. For this, I thank my spiritual master dearly for teaching me where to get real protection from. For the only immediate shelter we all have is in our Supreme Lord. Chant the Holy Names, Everyone. This is our real protection." Edited 1 time(s). Last edit at 01/20/2018 07:35AM by VoxVeritasVita Das. Video contains an interesting clip of Senator Inouye from 1987 (an old enemy of Chris Butler?). Serving the Pleasure of Whom? We can not allow our political leanings and confirmation biases to obscure the harmful history of Butler's cult opperations and undue influence on individual lives. Bart Dame's thread was most interesting. He is political enough to fanticize that Tulsi might be independent of Butler when he likes her politics. There are people in the alternative media (Libertarian, Neo right, or whatever alternative to the mainstream) who believe there is a shred of free humanity in Tulsi. (see recent video Dear Tulsi Gabbard, Re: The Gender Pay Gap (I am posting this video as an example of the alt right liking Tulsi. The content is irrelevant to my point). Either way, everyone seems to find something to like in Tulsi from a right or left political lens. This is a problem that diverts us from Butler's alleged crimes (moral or legal), and the destructive influences on the lives of his followers. Others think that Tulsi only serves the pleasure of her guru. Why is anyone surprised that they can not get straight answers from Tulsi? Tulsi is a consumate politician who stradles the needs of both masters; the Democratic Party and her Gurudev. At least she gives lip service to both. Regarding Tulsi, the question is if she can serve two masters? Or is she surreptitiously serving only one master? just-googling ~ check your messages. "Regarding Tulsi, the question is if she can serve two masters? Or is she surreptitiously serving only one master?" This is much, much more than doctrine. moral assumptions, be quite different depending on whether your OS is western cultural or Hinduistic. In Western culture the assumption is there is one truth, all the time, all situations, all persons. Recall the statement from the New Testament: "Let your yes be yes, let your no be no. Anything else is from the Evil One. Oh yes, nearly forgot. There is a distinction between good and evil. Batman vs The Joker. Black hats, white hats. By contrast, in the Hinduistic belief system there there's the two truth doctrine. There's relative truth, as perceived by our deluded senses, and there is absolute truth, as perceived by those who are Enlightened. What those mired in relative truth (including the God of the Old Testament, the prophets and Jesus) would name as murder, deceit, bearing false witness, defrauding widows and orphans -- this may actually be holy behavior from the standpoint of one who is Enlightened. of the true Reality sees this as death. We are not our bodies, says Krishna. Or does she live and think and swear oaths of office from the Hinduistic Butlerian two truths stance? for having lied to them for their own good when campaigning for office. All this is clumsy speculation on Corboy's part. But this question has to be asked - and pondered. Tulsi is not a private person. when creating the laws and Constitution of the United States of America. Edited 2 time(s). Last edit at 02/16/2018 02:09AM by corboy. EXTREMELY IMPORTANT POINT THAT CORBOY HAS MADE !!! when creating the laws and Constitution of the United States of America.” End quote. Tuco asks the question- Is it not clear whose side she is on? Smells like a 'two-truths' rat to me. of having the International airport in Honolulu named after him. Welcome to Daniel K. Inouye International Airport. were, from standpoint of Chris Butler, karmis. Repeat, from the standpoint of Chris Butler, from the standpoint of Chris Butler Krishna devotees, from the standpoint of Srila Prabupada and of his Krishna devotees, the Founders of the United States of America were karmis. A karmi is someone who does not share the beliefs of Chris Butler, or of Chris Butler's guru, Srila Prabhupada. The Founders of the United States of America were a motley crew of Unitarians, Quakers and several different Christian denominations. They followed the Western one truth operating system. They did not believe there is a relative truth known only to unenlightened 'karmis' and an Absolute Truth known to those Enlightened. The Founder's benchmark was that of "the reasonable person" -- not the Enlightened Person. In an American court, a jury reviews the evidence and arguments of both plaintiff and defendent using the standard of reasonable doubt. Because in Anglo American Common Law the benchmark is *not* Absolute Truth, or Perfect Truth. Anglo American common law is content to remain at the one truth deluded karmi level. From the Chris Butler devotee standpoint, Anglo American common law was created and is revised by karmis! did not believe in the Krishna doctrine. There was a big crowd of people waiting as we disembarked in Tokyo airport..... As we rode in a small car with Prabhupada through the congested city, Prabhupada asked me, "Is this your first time in Japan?" I replied, "Yes." I was grateful that he had asked. Although he had so many higher things to consider, he took time to make such an inquiry from an insignificant servant. From the car window we could see factory buildings on both sides and everywhere heavy traffic of small automobiles and pedestrians. The weather was cold?no more beaches and palm trees. "These Japanese workers," Prabhupada said, "are all simply karmis involved in a fruitless pursuit." What would Srila Prabhupada, Chris Butler's guru, have said of the Founders of the United States of America?